The wild and overgrown foliage of this scene is a distinctive feature of Kolbe’s extraordinary and original art. 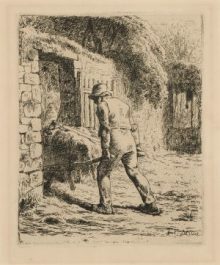 He termed such images ‘Kraüerblätter’, or ‘vegetable leaves’. The intricate detail of the enlarged shrubbery is accentuated by the distinct areas of light and shadow. 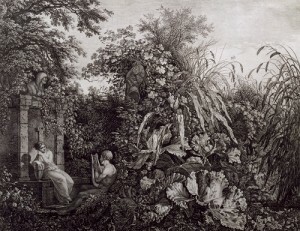 The strange vegetation almost engulfs the idyllic love scene, contrasting the fragility of man and love with the unconquerable powers of nature. A dream like fantasy, the image is suggestive of a wish to be at one with nature, or even to be consumed by it. 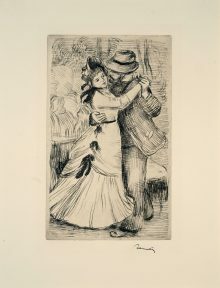 A self-taught print artist, Kolbe felt an intense identity with nature, one that was shared by other Romantic artists.